Built in 1965 at a cost of $3 million, Memphis Memorial Stadium was constructed as part of the city's Mid-South Fairgrounds, and was initially dedicated to Memphis' military service veterans. It was built in part to provide a permanent home for the Liberty Bowl, a college bowl game that had moved to Memphis from Philadelphia (by way of Atlantic City), and shortly after the first game in its new home the stadium was rechristened the Liberty Bowl. With seating for 50,180 at the time the USFL awarded Logan Young his franchise for Memphis, the facility hosted one of two USFL sellout crowds. It later grew to a seating capacity of 62,380 thanks to a 1987 expansion. 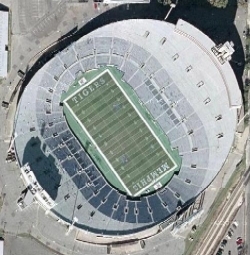 In the early 1990's this expansion helped facilitate an effort to get an NFL expansion franchise, and also succeeded in welcoming the CFL's Memphis Mad Dogs for a year. The NFL finally came calling in 1997 when the Houston Oilers relocated, intending to play two seasons in Memphis while a stadium in Nashville was being constructed for them. Disgusted at the thought that the NFL was going to Nashville instead of Memphis, fans stayed away - and after just a single season the Oilers left, moving into Nashville's Vanderbilt Stadium rather than play to Memphis crowds that were smaller than what the Showboats had drawn 15 years earlier. On New Years' Day 2007, Memphis mayor Willie Herenton proposed the Liberty Bowl be replaced with a new, state-of-the-art stadium. The proposal gained little traction.